Last run of a T1 in the U.S.A: see 2100's last run in the US before moving to Canada for overhaul. Reading Company technical & Historical Society: dedicated to preserving the history and equipment of the Reading Railroad. Railroading in the Northeast . WOWAK.RAILFAN.NET: Wowak's Images of Railroading . Wes Barris' Reading T-1 page . 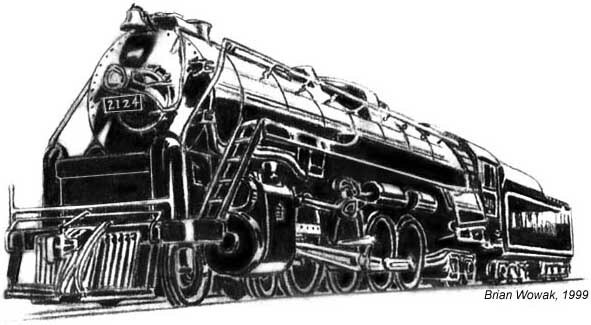 Steamtown National Historic Site: National Park Service page. Reading & Northern Railroad: Owners of T1 2102. Elgin County Railway Museum: current home of T1 2100. B&O Railroad Museum: Home of T1 2101. E-mail the webmaster, Brian Wowak, at 2124@USA.NET.